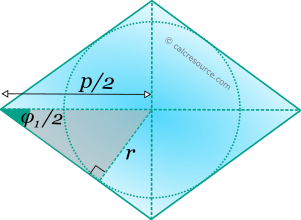 This tool calculates the basic geometric properties of a rhombus (also called diamond shape). Enter below the shape dimensions. The calculated results will have the same units as your input. Please use consistent units for any input. 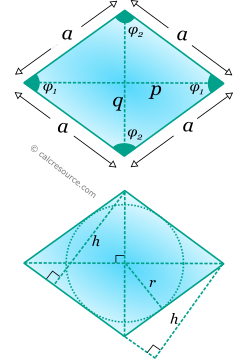 Rhombus (also called diamond shape) is a quadrilateral shape with all four sides equal. Pairs of opposite sides are parallel and pairs of opposite angles are equal. 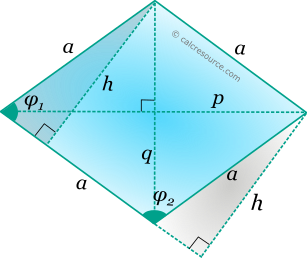 Therefore rhombus is also a parallelogram and features all parallelogram properties. It differs from square in its interior angles which are not all equal and 90°.